Nowadays, however the brochure is reaching more people in varied ways through technology. The mobile device, for example, is a huge area marketers must cater to with their promotional material. In today’s blog we help you answer the quandary: How can you make brochures online? It’s a simple as 1,2,3. 1. Simply create a PDF of your brochure. 2. Them import the PDF into the digital publishing software. 3. Add interactivity, with features such as animation, audio, video, image galleries, and web links. Then click build. And your brochure has been created. Now you can share it via email, your website and social networks, and it can be accessed form all devices, from PCs to tablets and Macs to android smartphones. Now let’s look at an online brochure sample. 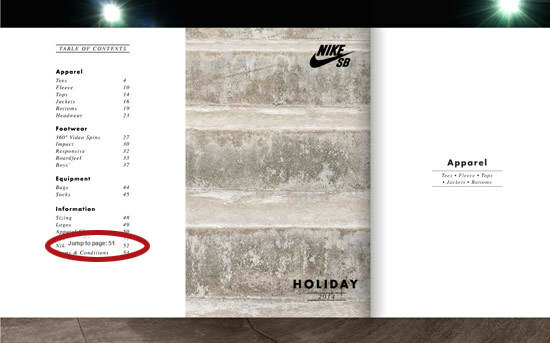 Please see the Nike Holiday 2014 brochure below. In this digital brochure Nike showcase their apparel, footwear and equipment. On the contents page Nike uses the jump to page feature. This is a super handy feature. It allows the reader to click on the page description they are interested in and then the brochure turns to that page, meaning they don’t have to navigate through all the brochure pages, it acts like a short cut. Please click on the image below to launch the digital brochure and see the feature in use. Another feature that leads to an increase in sales is showing and giving as much information on the products as possible in your brochure. See below page 30 where Nike has included video to give the consumer a more detailed 3D view of the training shoe. Click on the image below to launch the eBrochure, then click on the play video. Nike has also used their own background image to give their brochure a further feeling of style and appeal to the market they are targeting. This is easy to do. Please see a video tutorial below. There is a range of generic backgrounds that come in the publishing software, but many publishers and marketers like to use their own image that is in keeping with their corporate image. I hope today’s blog has enlightened you to the effect a digital brochure can have for generating business online.